March 30, 2011, with the ending of the recruitment in Nanjing station, the Shanghai Shibang 2011 campus recruitment ended. We recruited more than 120 graduates in 10 position including business management, mechanical / technical elite and international marketing positions. 2011 Shibang campus recruitment aimed at laying a solid talent base for sustainable development by attracting highly qualified personnel with innovation consciousness through high-quality channels of the universities. To this end, the recruitment team held meetings in Beijing, Tianjin, Jinan, Nanjing and other seven cities and entered nearly 20 colleges and universities include Peking, Tsinghua, Renmin , Nankai, Shangdong, USTC and Nanjing. 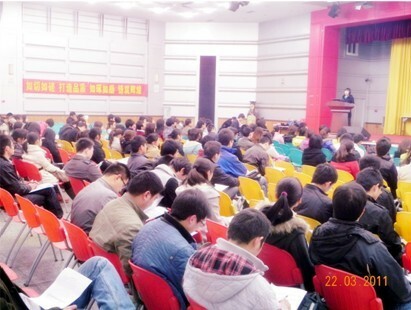 Recruitment propaganda got favorable response receiving nearly 3,000 resumes during the lectures. Together with the resumes delivered through the internet, about 8,000 resumes were received, the number increased nearly 30% compared with last year. After resume screening, written test and interview, more than 120 employee letters were ultimately signed, including 34% master degree or above and 66% bachelor and dual bachelor degree. Mention the quality of this recruitment, Mr Zhang from recruitment team reflected: "Total effect is still quite good. We could obviously feel the influence of the rapid development.Many students also changed our slogan 'Crush the rocks, build the dreams' into 'Build our dreams', said the Shanghai Shibang can accomplish their dreams. This also coincided with our recruitment topic ' person who can see the future'. We want to build centennial company, and so need employees who can grasp the future, require long-term stable development. " During the recruitment process, many students expressed the Identification of the Shibang recruiting theme: "the process of looking for job is a process continue to torture ourself about what we want, what our future will be if select your company. View from your recruiting team, I can feel a very strong gallop, harmonious atmosphere. I believe my future can be found here! "